Most people are visual. What I learned early on in my direct sales career was that talking to people never worked as well as showing them. That’s why I used props during my home party presentation. That’s why I use an image in every blog post I write. Things that are visual draw people in. When I started coaching and working with my clients teaching them to set goals several years ago, I saw a need for a visual way to look at that process. That’s where the Anatomy of a Goal model came from. This tool can be used over and over again to set your goals and then create an action plan for making it happen. As you look at the above illustration, notice a few things. First of all, the goal is at the top of the pyramid and is the smallest portion. That’s because it’s truly the smallest part of the process. You can’t control the goal. You can control how passionate you are about it and what you do to make it happen. The middle section is your “why.” I’d like to encourage you to come up with at least three compelling reasons “why” that goal is important to you. Remember, if it’s important enough to you, you’ll find a way. If it’s not, you’ll find an excuse. Find your passion in this step. The bottom section is all about action (your “how”). It is the largest section, the foundation of the pyramid, and the section the other two sections rest upon. That’s not an accident. Action is the key to success, no matter what your goal is. I’m asking you to come up with nine action steps. That may seem like a lot, but it forces you to get creative. The more actions you can take in service of your goal, the more likely you are to reach it. 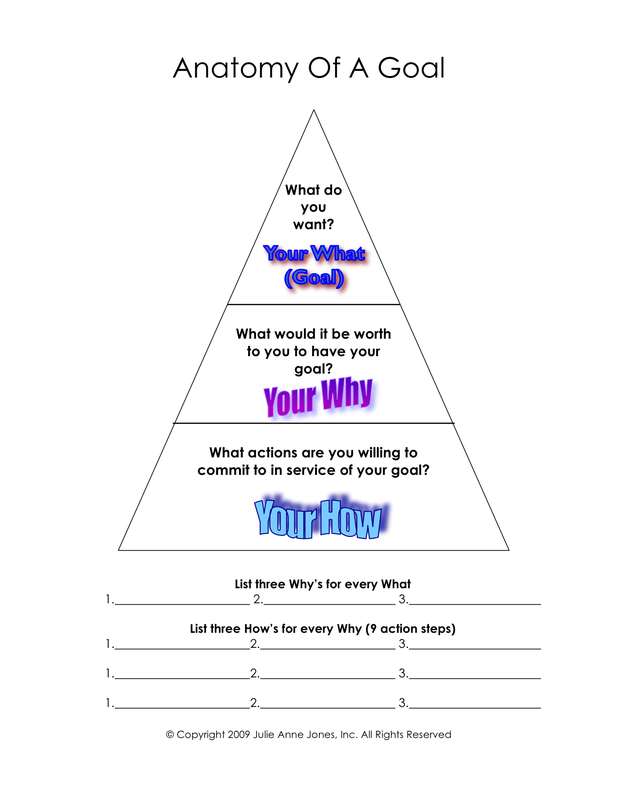 So take a few moments some time this week and draw a simple pyramid on a piece of paper (or better yet, download this worksheet here), and then create a clear path and plan for actually reaching it.